The post Samsung Galaxy S9 and S9 Plus now support Google’s ARCore appeared first on MobileSyrup. 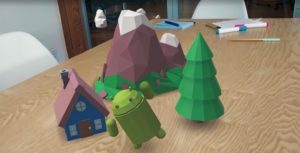 Google’s ARCore augmented reality platform now supports the Samsung Galaxy S9 and S9 Plus. As spotted by 9to5Google, the Mountain View, California-based tech giant has updated its list of ARCore-supported devices to include Samsung’s latest flagship phones. Version 1.0 of ARCore was officially launched in late February, adding improved environmental understanding that allowed virtual assets to be placed on textured surfaces, such as posters, furniture and books. One of the notable aspects of the Galaxy S9 and S9 Plus at launch was the fact that the phones did not support ARCore right away. The newly added support will help Google better compete with Apple’s ARKit, given that the latter company’s toolkit is compatible with approximately 500 million devices, including iPhones and iPads.